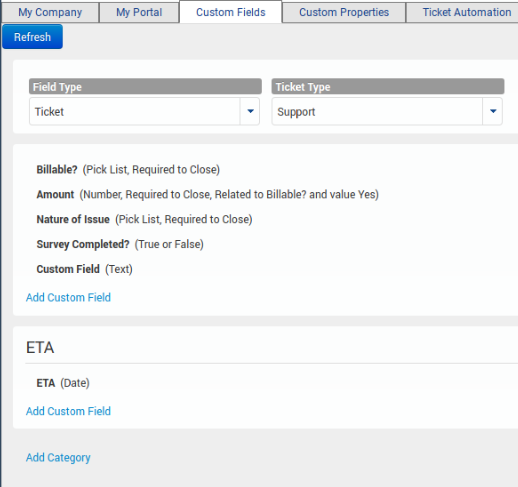 The Custom Fields section allows you to create fields unique to your organization for a handful of areas including Tickets, Users, and Customers. Each of these different areas in the application can have as many different custom fields as you want. 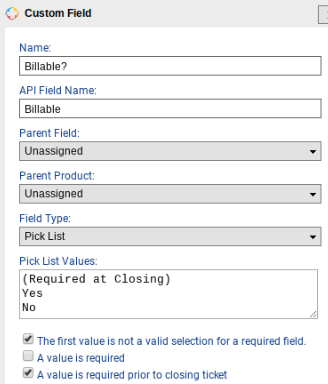 Simply select the field type where you want to modify the custom fields in the “Field Type” pulldown. If you choose Ticket, a second pulldown for Ticket Type will appear. To add a category, click “Add Category”. You can always rearrange the custom fields into categories by dragging and dropping. To add a custom field, click “Add Custom Field” and the following form with appear. The required fields on this form are Name and Field Type.